A churchwarden faced her fear of heights and jumped out of a plane at 12,000 feet to raise money for charity. Jan Rainer agreed to the parachute challenge after making a remark about doing it while chatting to a group of parishioners at Holy Trinity Church, Milton Regis. On the day she found herself alongside a group of 18 and 19-year-olds who were also due to do a skydive from the aircraft, which took off from Headcorn Aerodrome. “They were very supportive,” said the 64-year-old. The whole experience was more than a bit nerve-wracking though. 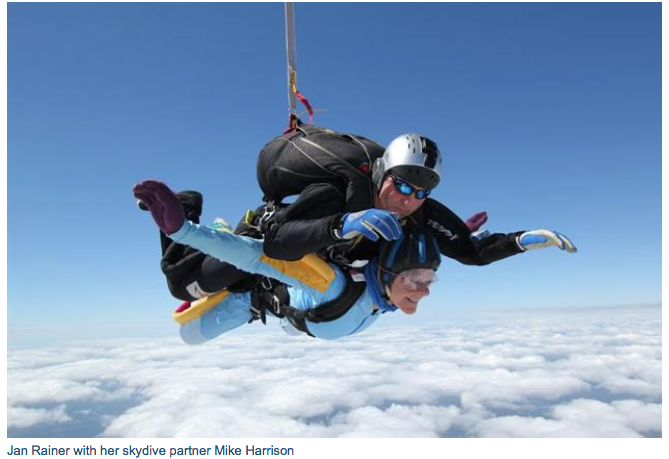 At one point she could not stop shaking but, remembering her training, she calmed down and listened intently to the instruction of her sky dive partner, Mike Harrison. The grandmother-of-five has raised £1,500 for Macmillan Cancer Support. Patricia/Nigel - One for you? It is all in a good cause!